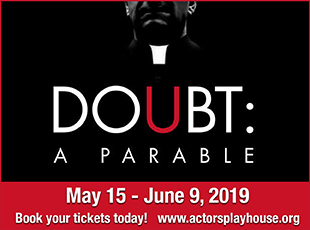 The show is a joint production of the Adrienne Arsht Center and the University of Miami Theater Arts Department so we have student actors working with two professional Equity members, Richberg and Tom Wahl. Students they may be, but the kids hang step for step with the pros. Based on the novel by Dave Barry and Ridley Pearson, this stage version by Rick Elise is a deliciously campy prequel (God, I hate that word) to the advent of the famous Peter Pan. Played on a wonderfully imaginative set, (a Victorian sea port; A Royal Navy ship, The Wasp; an older sailing ship, the Neverland; ((full rigged models of the sailing ship are sailed? around the stage)); ship's cabins, bilges, decks, bowels and passage ways; a mountain top; a jungle; a crocodile cage; a beach; the ocean above and within; and of course, a stormy night). 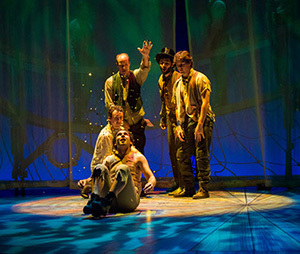 "Peter and the Starcatcher" is a two and a half hour feast of music, dancing, joking in a play that would delight most any child. And certainly all adults with a sense of humor. Highlights are too many to count but Mrs Bumbrake's alliteration scene is one, the dancing pirates is another as is the second act opener with the dancing mermaids. Worm eating and vomiting also entrance. Tom Wahl is the frightfully British Lord Aster and Abigail Berkowitz is Molly, his 13 year old daughter. They keep secrets by speaking in Dodo, Porpoise and Norse Code (it comes from the Vikings). Boy/Peter is played by Joshua Jacobson and Thomas Jensen is, traditionally, Mrs Bumbrake, Molly's Nanny. Timothy Bell and Timothy Boehm-Manion are the orphan boys Prentiss and Ted. Robert Fritz is Slank, Captain of the Neverland and also Hawking Clam (eww), son of Fighting Prawn, Chief of the Mollusk Islanders, who is played by Alejandro Gonzales Del Pino. Del Pino also plays Grempkin, the whipping Orphanage schoolmaster. Michael Mancini is Alf the highly flatulent seaman who courts Mrs Bumbrake. 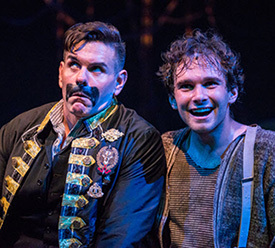 Captain Robert Falcon Scott is played by Liam Merkle and Matt Sawalski is Smee, Black Stache's first mate. 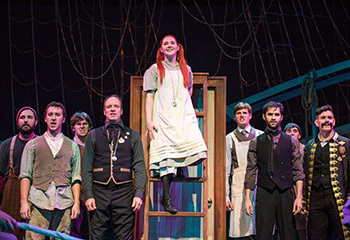 Ten student actors and not an amateur among them. 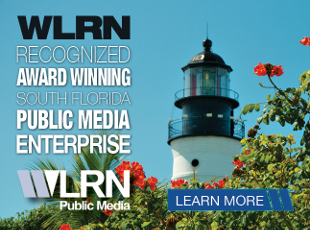 The show plays through October 26 in the Carnival Studio Theater at the Arsht Center, 1300 Biscayne Boulevard, Miami. 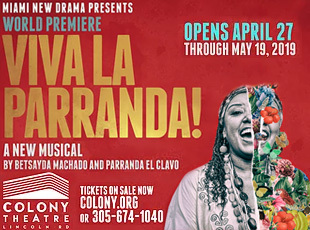 305-949-6722 - http://www.arshtcenter.org.